As I stated in part 2, I'm all but certain that I discovered Taraf de Haïdouks by stealing their music in a shot-in-the-dark gesture on Hotline, something that led me to discovering Fanfare Ciocărlia in a rather roundabout way more than a decade later. For undescribed reasons I also questioned in part 2 whether I had aptly stolen Taraf de Haïdouks' music, which I'll now try and explain. 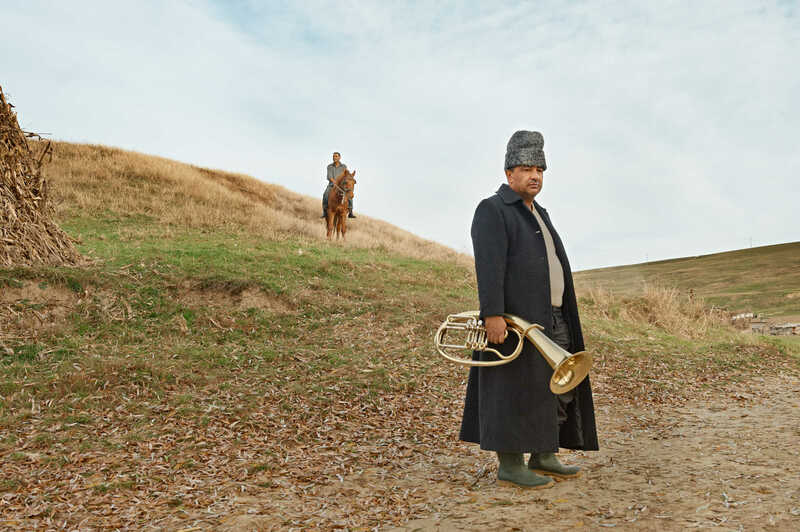 As recently stated by Costică “Cimai” Trifan, one of Fanfare Ciocărlia's four trumpet players and two lead vocalists, "we have a saying in Gypsy language: 'A good musician is stealing everywhere whatever is possible.'" If I understand this correctly, a good musician is someone who soaks up the array of different sounds they come across, eventually adapting and integrating those sounds into their repertoire. If I'm also not mistaken, there's probably no other musicians that have done this more effectively over the years than travelling Gypsies. Somewhat similarly, it's been pointed out to me while writing this series that the practice of copyrighting music is a rather recent one, and that in times previous to when even sheet music was around the traditional way in which musicians made their money – i.e. living – was via giving performances. It was then suggested to me that since copyrighting music stems the traditional free flow of music ("stealing" music) and since by these traditional standards charging over and over again for the performance of a particular piece of recorded music is absurd, ripping music off of YouTube is therefore justified. Can the aforementioned Gypsy saying be interpreted to justify this theft of recorded music? As far as I can see it, absolutely not. One issue with recorded music is that by unavoidably placing it in a physical format – be it on parchment, plastic, zeroes and ones, whatever – investment is required for the recording, mastering, the medium itself, etc. This costs money, and as opposed to performances, most of the proceeds from sales of recorded music is siphoned off by middle men. In effect, to a certain extent recorded music is little more than an advertisement for the performances of musicians since this is where their living is predominantly made. So while the aforementioned Gypsy saying was inferring that one "steals" influences from far and wide – as opposed to stealing whatever one wants – the simple fact of the matter is that music is by no means a biological necessity like food (which in some cases can be justified stealing), and if one really has a problem with copyrights on recorded music or recorded music in general then rather than refusing to hand over one's money the simple thing to do would be to refuse to hand over one's ears; or, simply grab an instrument and play music on one's own or with friends and family – the "traditional way". Anyway, although I don't exactly have the funds to go throwing around at music albums, I knew that I was never again going to inundate myself by purchasing very many albums, and seeing how Taraf de Haïdouks don't seem to be using their earnings to live the high life, last year I went ahead and bought most of their albums (directly off their label's website), along with another few Kočani Orkestar albums (two off the aforementioned website and another two off of Google Play). Upon discovering Fanfare Ciocărlia shortly thereafter, and since MP3s of their albums weren't offered for sale on their label's website, I similarly bought their entire library off of Google Play. And besides one (live) album by a Colombian band that Fanfare Ciocărlia recorded a song with, that's all the albums I've since purchased and is all I expect to purchase for a long time – twenty in total, which I suppose isn't too bad. I'm not sure how much Fanfare Ciocărlia and their label (started by their manager Henry Ernst) get from me buying their albums off of Google Play versus how much they get from CD/vinyl sales (or especially from performances), but seeing how I can't give them any baksheesh (such as via a donation button on their label's website) and how out of appreciation I'd like to give them a few bucks to cover their recording costs and/or possibly help fund a future album, then sure, I'll hand over a few bucks for their albums even though Google and whomever else will probably siphon off most of my money. It fortunately helps that I again don't get the impression that Fanfare Ciocărlia is made up of musicians living the high-life, what with the five of them still living in Zece Prajini (the five left-most in the above picture) continuing to involve themselves with agriculture in one way or another, while the others that moved to nearby towns and cities did so in order to accommodate their childrens' high school education. So having said all that, and with not being a very big fan of Google/YouTube, it's with a bit of trepidation that I conclude this series on music and Fanfare Ciocărlia with not only mini-reviews of Fanfare Ciocărlia's albums but, and since such things are apparently pretty much necessary now-a-days, with a sample song from each of their albums. That'd be their eleven albums, which includes five "solo" albums, three collaborative albums, two greatest hits albums (on vinyl only), and a live album. I'll also point out that I'm not even going to try and pretend that I can write about music in itself, so while giving a few words about each album, I'll just go ahead and cop out here by simply listing a range of musical styles from which Fanfare Ciocărlia is said to draw upon and sound like. We've got Turkish military brass / Turkish marching band, Romanian, Hungarian, Bulgarian, Saxon, Macedonian, Serbian and Middle Eastern rhythms, Romanian dances, Oriental dances, deep Balkan blues, manic party music, eastern funk, and a heavy, heavy monster sound, all of which comes with a rip-roaring intensity that others can only dream of emulating. And the repertoire, as a brass band – but this also holds true with Taraf [de Haïdouks] – was wedding music. They were wedding musicians. That's their reason for being. They aren't artists who suddenly decide, I'm going to be an artist and I'm going to embark on a career, and I have the feeling I can market myself real well, and I have the feeling I have to express myself. Not at all. There is talent backed up by training and a family, who pushes it, stands behind it, and says: hey, this is how you will earn your money; do it. That's how children grow up. They start when they are four. And when they are sixteen they start playing at weddings, and this is how they earn their money. And this is the philosophy of life. While having never harboured any romantic notions about Gypsies or a roaming Gypsy lifestyle or whatever, why am I not surprised in the slightest to find out that the most wonderful music I've ever heard isn't played by a bunch of "artists" but by a bunch of guys that grew up on the land? Their absolutely stellar debut, this is Fanfare Ciocărlia in its most raw sounding form and is the album that instantly earned them the deserved reputation as being "the speed kings of Gypsy brass" and "the fastest in the blow biz". Overflowing with joy, humour and manic intensity, I for one was in awe – and remain in awe – that music could sound like this. Hora cu Strigaturii: Really? Brass can not only be played this fast, but with the utmost finesse? As I wrote to a mate of mine describing this song, "I've got steroids in my ears. Beautiful, beautiful steroids." Although the occasional attempt is again made to outplay the sound barrier, the tempo mostly slows down and is dominated by a more mellow and groovy Eastern sound. Asfalt Tango: If the previous song had you transfixed with its sheer speed, then this one quickly shows Fanfare Ciocărlia's stylistic dexterity and what Eastern brass can sound like, at its best. More subtle than their first two, the trumpets are at their most piercing in this offering. Hora Lautaresca: They do fast and manic, they do slow and groovy, but they also do soft and beautiful. With rampaging tubas on the loose this is easily their heaviest album yet - what I've seen described as "eastern funk". While the translation of Gili Garabdi fittingly means "mystic tune" in Fanfare Ciocărlia's Gypsy dialect "Ursarii", since I've yet to find another Balkan and/or Gypsy brass band that comes even close to consistently matching the sheer wonder of Fanfare Ciocărlia, "Ancient Secrets of Gypsy Brass" is a rather polite gesture when it should probably be titled "Ancient Secrets of Zece Prajini Brass". If I have one complaint about the album that would be in regards to the inclusion of the DJ re-mixed final track, which I solved by simply deleting the MP3. Nonetheless, while this was the first album I ever heard by Fanfare Ciocărlia, if you don't want to start at the beginning or with their most recent, this or Iag Bari might be their best introductory album. Hora Evreiasca: Tubas that'll curl your upper lip and a menacingly serpentine clarinet of Oprică Ivancea that'll almost pacify you to Australia's most venomous. Their first non-solo album, this is also their first that follows the passing of Ioan Ivancea and so features various Gypsy musicians from across the Balkans in homage to the late clarinetist, playing a variety of Gypsy songs. Its comparative lack of something (it sounds more like a compilation?) in comparison to their first four initially put me off this one, but it grew on me and is now on my regular playlist. Duj Duj: Having to choose just one song from these albums is a bit tough, so while I'd really like to embed "Sandala" with vocals by Serbia's Šaban Bajramović, here instead is "Duj Duj" with vocals by Mitsou and Florentina Sandu, the latter being the granddaughter of Taraf de Haïdouks' late founder (and visionary violinist) Nicolae Neacșu. Their first best-of album, released in response to fans of Fanfare Ciocărlia wanting their music on vinyl. As good of a mix as any. Born to Be Wild: Of all of Fanfare Ciocărlia's songs this is the likeliest one you've heard, what with it being commissioned by Sacha Baron Cohen to appear in the closing credits of his film Borat. As Ernst describes it, "The band had never heard the original. I played it to them and within one hour they'd picked it up – and within three hours we'd finished our own version." Almost makes you wish there was a program you could insert MP3s in one end and which come out Fanfare Ciocărlia-ized the other. Almost. A performance they gave back in 2004 and so inclusive of Ioan Ivancea. If you doubted their ability to play so fast yet so deftly without some kind of doctoring going on in the studio then this album will prove you wrong, while also displaying the playfulness to their music. Ciocărlia: A song from their first album, the sheer joy washes over you. Their second non-solo album, this one being a playful "battle" between Fanfare Ciocărlia and Serbia's Boban & Marko Marković Orchestra, and my least favourite overall. That would be due to the inclusion of the Boban & Marko Marković Orchestra who can be rather pop-like with their sound and also rather... Western sounding? 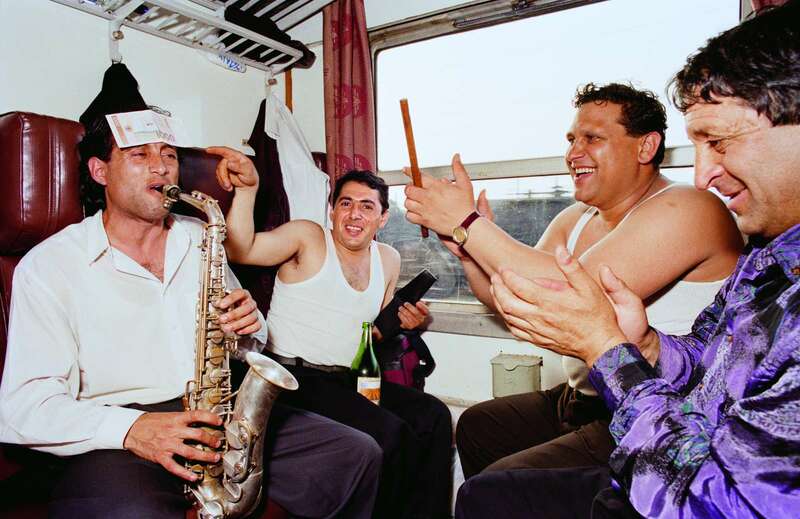 Likewise, Fanfare Ciocărlia's rendition of "Caravan" is much more tame than the version on Gili Garabdi and lacks that eerie Balkan sound that that first song I heard of theirs endeared me with. This is their only album I don't really listen to. Devla: Of the five songs that Fanfare Ciocărlia and Boban & Marko Marković Orchestra duo on "Asfalt Tango" is probably the best, but as I've already embedded a version of that song here's "Devla". As soon as I heard Devil's Tale I instantly grabbed a copy on CD for a mate of mine who incidentally doesn't like brass music, expected not to like it, but found it to be utterly fantastic. Because if Balkan Brass Battle was rather lacklustre, then Fanfare Ciocărlia's third collaborative album – this time with Guelph, Ontario's, Adrian Raso – more than makes up for it. A relatively unknown guitarist with tarantella roots and a hankering for Gypsy jazz, Raso cold-called Fanfare Ciocărlia in the far-fetched hopes of getting them to guest play on a single song on an upcoming album of his. They liked his material so much that they agreed to not only guest on a single song but suggested an entire album instead. But while sharing an admiration for Gypsy jazz, what Fanfare Ciocărlia and Raso also share is that they derive from a place where horses and carts are still used: although none of Fanfare Ciocărlia's members use horses and carts anymore they're nonetheless still used by villagers in Zece Prajini; and although I don't imagine that Raso gets around in a horse and cart very often, the Mennonites in the area (some of whom I've brushed shoulders with while attending the Guelph Organic Conference) certainly do. Swing Sagarese: A lot of the previous brass music I (painfully) listened to was hokey and contrived swing music, from back when that stuff was all the rage in the first few years of this century. This one redeems that schlock nicely. While this album might have the most character of all, a couple of riveting covers/interpretations of songs written and/or performed by Maria Tanase (a Romanian singer from the mid-20th century) adds to the album a slightly haunting touch, perfect for the "apocaloptamist". Although I won't call this album (or any of them) my favourite, even though I avoided buying this album for several months after purchasing their first four because I misguidedly thought Fanfare Ciocărlia was now playing commercial garbage, in total I've probably now listened to it more than any other. Hora Strengarilor: Although I'd like to embed one of the Tanase covers/interpretations or one of several other songs, I'm going to have to go with the Hora again (I tend to like the Horas – a Romanian dance – I've noticed). Of all of Fanfare Ciocărlia's songs this one definitely makes me smile/laugh the most, so much so that when I'm out and about in the city and knowingly looking like an idiot with a set of ear buds lodged in my head I don't want to look even stupider by having a big smirk on my face. So I hold in the smirk, which just makes my eyes well up with tears instead, making me look like an even bigger idiot that I was trying to avoid. If you can't crack even the slightest smile with this one then perhaps Guy McPherson's Nature Bats Last may be more suitable for you than FF2F. Their second best-of album, this one released for their 20th anniversary and split up over four themed sides of two vinyls: "ROOTS captures them as a village brass band. ORIENT gathers their most Eastern recordings. JAMS features their funkiest sides that make clubs jump. AMIGOS demonstrates Fanfare’s wide ranging collaborations, from backing Macedonia’s Gypsy Queen Esma Redzepova to rocking with Canadian guitarist Adrian Raso." Lume Lume: One of their signature songs, this is another Maria Tanase cover/interpretation, "Lume Lume" translating to "World, sister, world" or "Life, sister, life". This is their fourth rendition of the song actually, what with a different version appearing on each of their first four albums (I was rather surprised to not see another rendition on Onwards to Mars!). If you'd like the opportunity of being able to pass on some baksheesh to Fanfare Ciocărlia in person, then as I mentioned at the end of part 5, you can see their tour schedule on their website or on their Facebook page, or, and as I've done, you can sign up with either Bands in Town or Song Kick to be notified if they plan on visiting your area.